Earlier this week, as part of our regularly scheduled inventory and evaluation of cultural properties, I took a specialist from Sotheby’s New York to see a painting a bit off the beaten track of Cranbrook’s usual spots to find art. 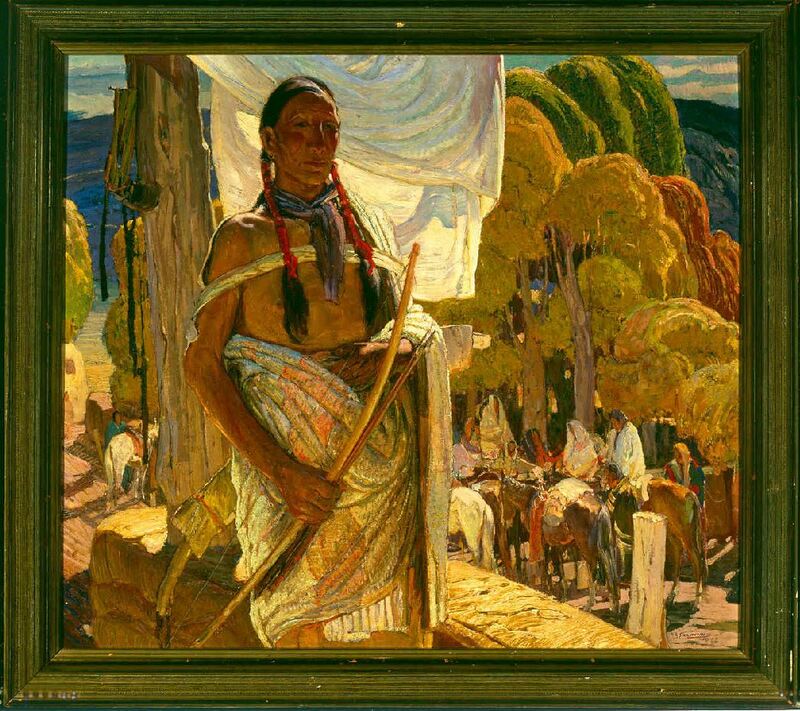 Hanging in the Cranbrook Kingswood Middle School for Boys, A Hunter of Taos is an incredible work by the American painter Oscar Edmund Berninghaus. Oil on canvas, 34 x 39 in. The painting shows a male American Indian proudly standing with a bow and arrows, while horses and riders pass behind through a rocky landscape and trees aglow in warm sunlight. The trees are made up of swirling golds, ochres, and greens, their abstraction complimenting the almost impressionistic rendering of the figures immediately below. The central hunter, however, is rendered clearly, with his face set immediately in front of a draped white fabric and his gaze looking back at the viewer. The scale of the painting, about three-feet square, is impressive. But why is it here in the Boys Middle School, or even at Cranbrook? First, let’s step back a bit further to the artist himself: Oscar Edmund Berninghaus (1874-1952). A native of St. Louis, he began his career as a commercial lithographer, draftsman, and illustrator. He explored painting as a fine art through classes at Washington University and at the St. Louis School of Fine Arts, where in 1899 the twenty-five year-old was awarded a month’s long paid journey westward by the Denver and Rio Grande Railroad. On this trip, Berninghaus was introduced to beauty and culture of the American Southwest, particularly Taos, New Mexico. In 1925, Berninghaus relocated permanently to Taos. He painted landscapes, animals, and scenes of daily life in the pueblo and village. In A Hunter of Taos, the model was Santiago Bernal, a Pueblo farm laborer and frequent model for Berninghaus. 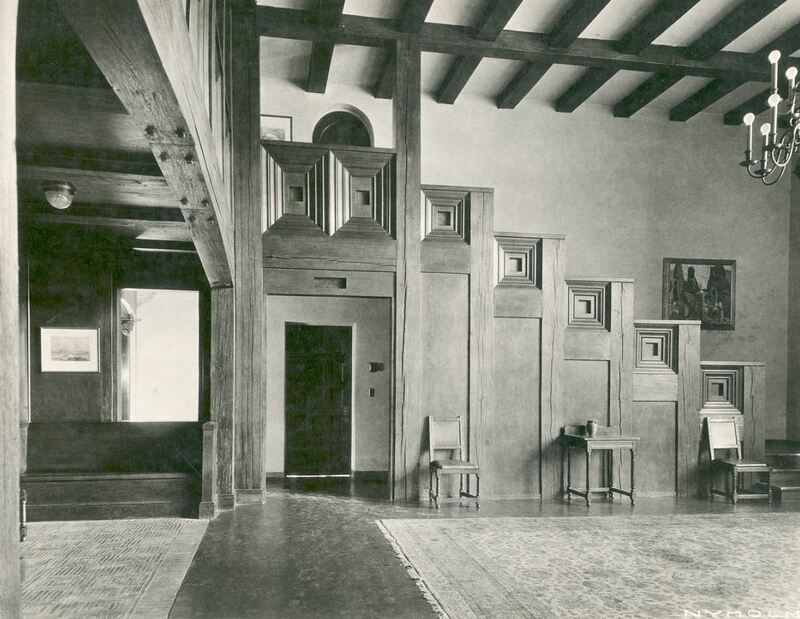 In a letter to a newspaper in 1927, Berninghaus wrote, “I think the colony in Taos is doing much for American Art. From it I think will come a distinctive art, something definitely American–and I do not mean that such will be the case because the American Indian and his environment are the subjects. But the canvases that come from Taos are as definitely American as anything can be. We have had French, Dutch, Italian, German art. Now we must have American art. I feel that from Taos will come that art” (as quoted in Pioneer Artists of Taos, p. 98). Our painting, considered one of the artist’s finest, was first exhibited at New York’s National Academy of Design in its 1926 Winter Exhibition. The work won the Second Altman Prize, one of several awards given out by the Academy of Design. On June 6, 1927, Henry Booth purchased the painting from the artist. View of A Hunter of Taos in the North Lobby, Hoey Hall, Cranbrook School. 1928. Peter A. Nyholm, Photographer. Cranbrook Archives. After Booth purchased the work, the painting hung in the north lobby of Hoey Hall for the opening of Cranbrook School for Boys in September of 1927. Henry formally presented the painting to Cranbrook School on October 18, 1927. 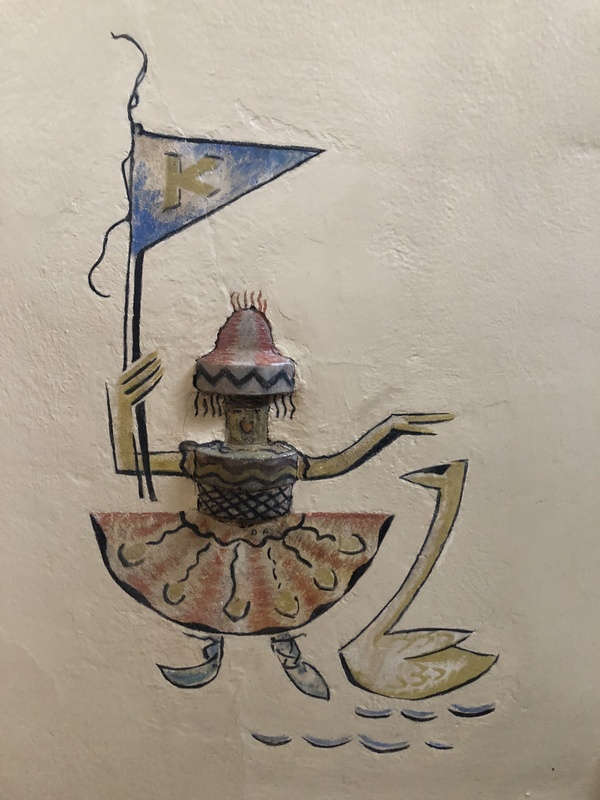 In the last half of the century, the painting was moved to the new Cranbrook Kingswood Middle School for Boys, where it hangs in a small lobby for administrative offices. Examining the painting Tuesday, we saw it is in excellent condition, and I appreciated that it’s in a spot where many young men and their parents have a chance to sit and appreciate it. It’s one of the great assets of Cranbrook that the campus is sprinkled with great art in all of our buildings—I think it’s a big part of what makes this place so magical. 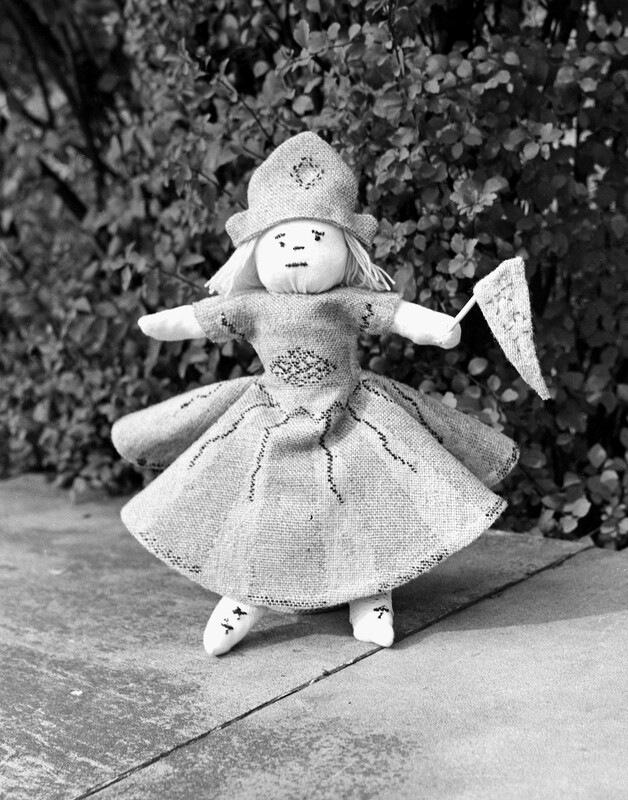 NB: If you want to learn about another Cranbrook connection to the Southwest and the Pueblo people, revisit this excellent post on Amelia Elizabeth White and her gift of Native American art and artifacts to the Cranbrook Institute of Science in 1937. Sixty years ago Cranbrook School headmaster, Harry Hoey, spoke to a group bundled in their warmest winter clothes at the formal dedication of the new outside skating rink at Cranbrook. The rink was unveiled on January 12th, 1957, at an estimated cost of $104,000. The new “artificial” rink, built on the site of the original natural ice surface, was constructed because there was a constant risk that the natural ice would not sustain a hockey season due to unreliable weather. Hockey player on the “natural” ice rink, 1940. Photographer Richard G. Askew. Copyright Cranbrook Archives. The new rink was built to hockey specifications (85 x 190 ft.) and was refrigerated by two over-sized compressors designed to operate in adverse weather conditions. 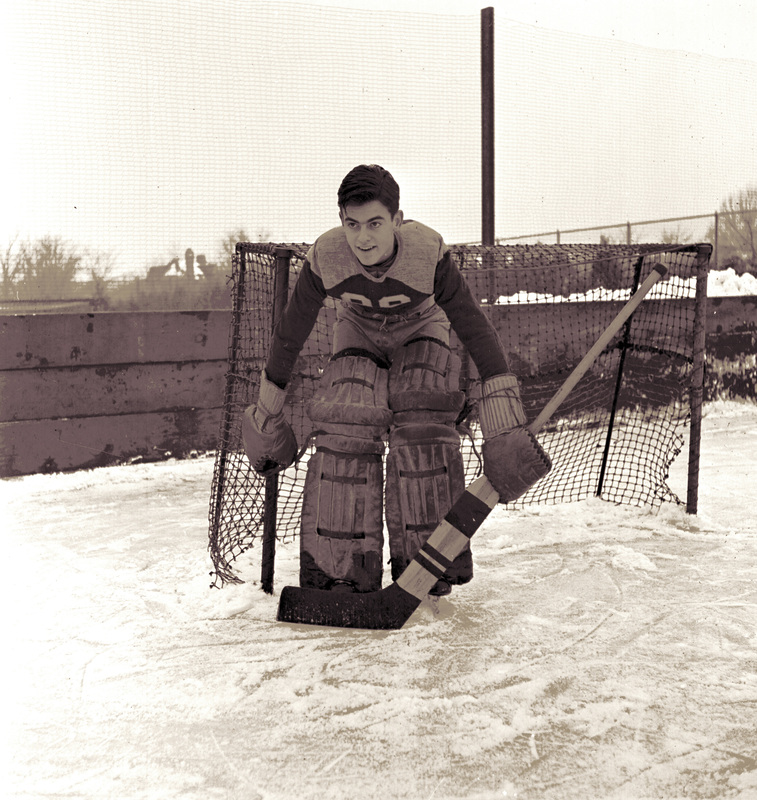 Artificial rinks were a relatively new phenomenon in the 1950s and Cranbrook researched the project for several years before proceeding. The planning team looked at rinks around the country, including Dartmouth, Cornell, and Williams College. Skaters at the artificial rink dedication. The Pontiac Press, 14 Jan 1957. 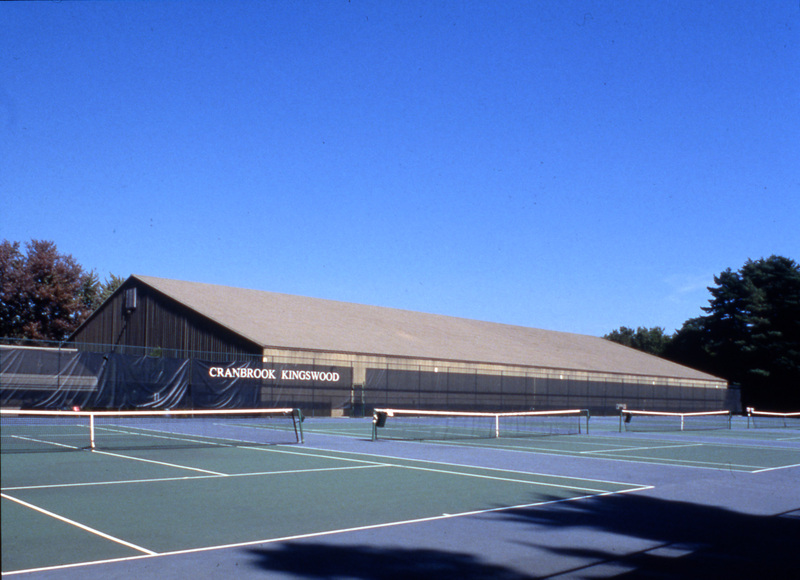 The rink was open six months out of the year and accommodated Cranbrook School ice hockey teams and students, as well as the outlying communities for day and night skating. From 1957-1982 the Cranbrook Skating Club oversaw all operations of the rink. During this time the club held Board of Directors meetings, generated correspondence for the raising of funds for daily operations, and supervised various program schedules, benefits, and employees of the skating rink. By the 1970s the rink was showing wear and the Varsity, Junior Varsity, and middle school teams were forced to buy ice time at neighboring rinks for practice and games. A committee was formed and students, faculty, and friends staged a skate-a-thon and worked with then-Cranbrook president, Arthur Kiendl, to raise money. 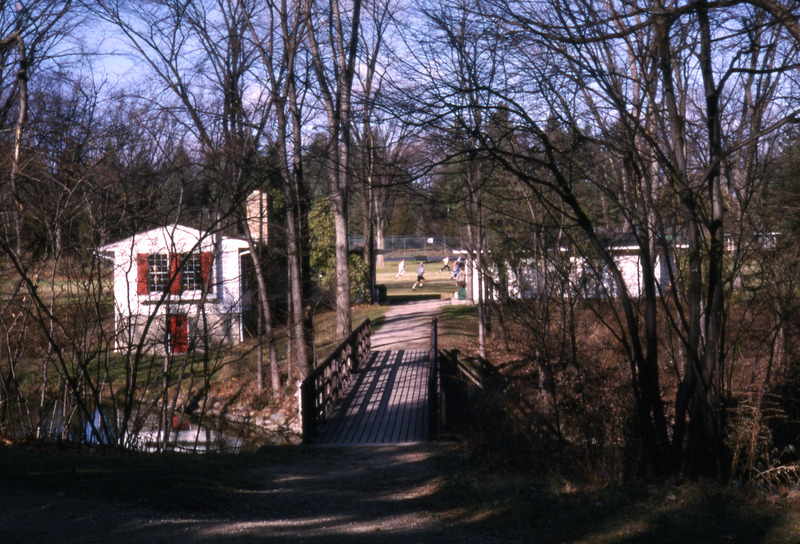 The original plan was to build a new enclosed facility for winter skating and summer tennis, but the price was too high, so committee members and Cranbrook administrators decided to complete the work in phases. 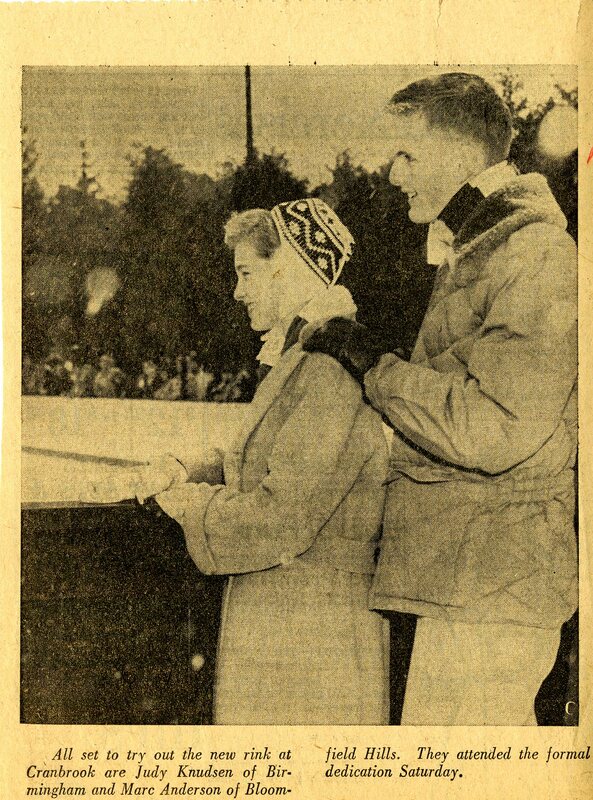 The first step – cement work for the rink surface and spectators’ section, new boards, and new piping – was completed with a gift by Grace Booth Wallace and her family in 1978. The final phases of the project – which included total enclosure of the arena – were completed in 1979. A view of Wallace Ice Arena with the tennis courts in the foreground. Photographer Balthazar Korab, Oct 2000. Today Cranbrook athletes, students, faculty, and the public enjoy the state-of-the art Wallace Ice Arena. Although the legacy of Kingswood School English teacher, Elizabeth Bennett* (1904-1983) does not involve Mr. Fitzwilliam Darcy, it is certainly the story of a woman who inspired and captivated multiple generations of students. 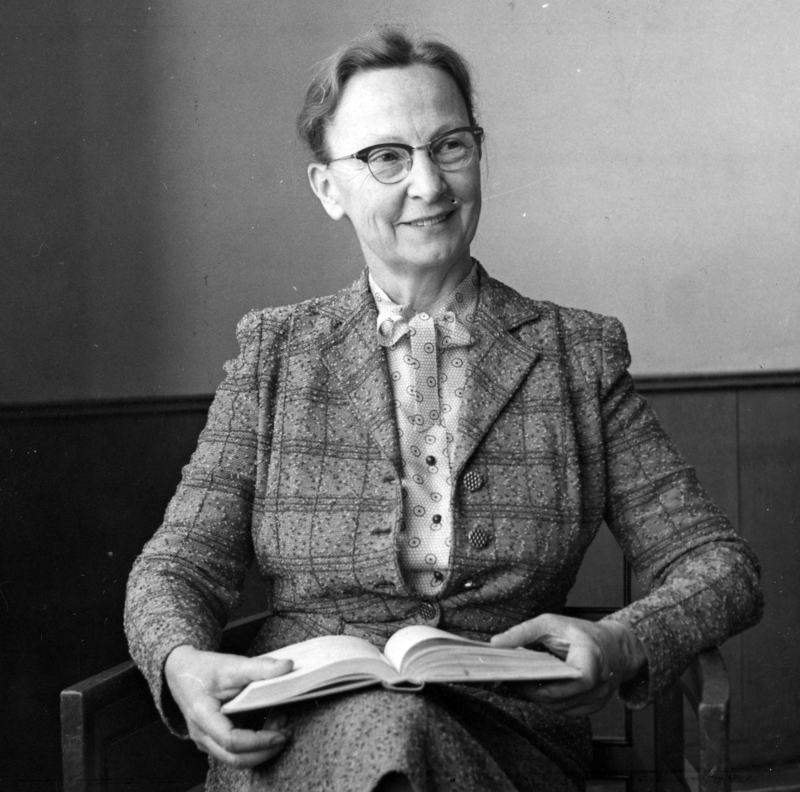 Bennett started teaching at Kingswood in 1936 after completing her A.B. from Oberlin College and her A.M. from Radcliffe College. 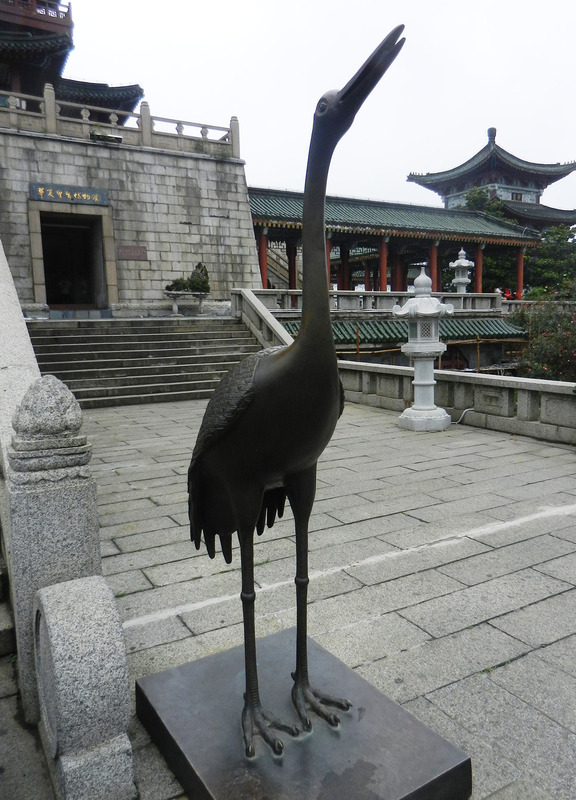 Prior to accepting the position at Kingswood, Bennett taught at the Hartridge School for Girls (Plainfield, NJ) and traveled in Europe and South Africa. 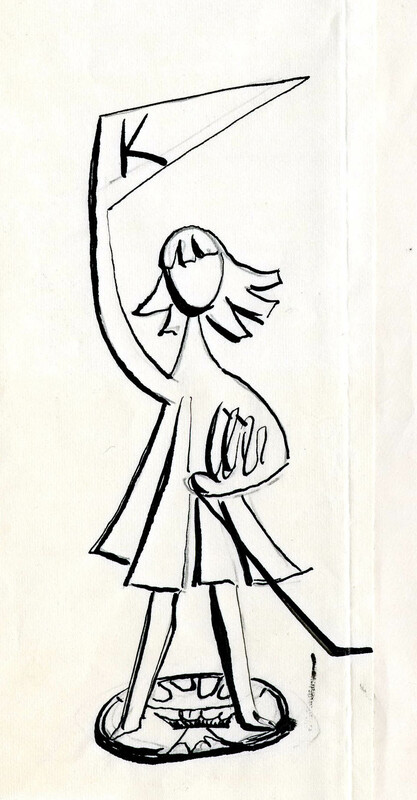 Portrait of Elizabeth Bennett, 1959. Photographer, Harvey Croze. Bennett was born in New York City to William and Mary Umstead Bennett. Her father was a lawyer and a member of the New York state senate and her mother was a professor emeritus who taught pianoforte at Oberlin College. 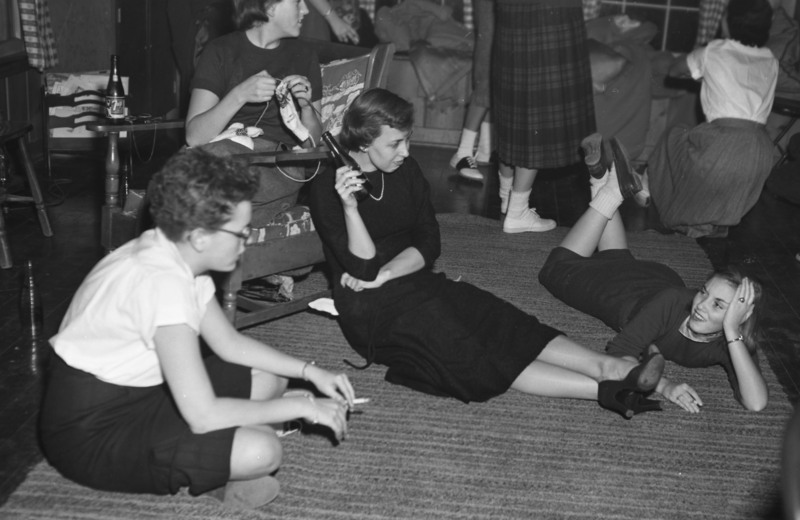 As a student at Oberlin, Bennett was an officer of the Women’s League – described in the campus yearbook as an organization for women to govern themselves and administer their affairs. She was later a member of the League of Women Voters and the American Civil Liberties Union (ACLU). During her more than thirty years at Kingswood, Bennett taught English, History, Bible, and Creative Writing. 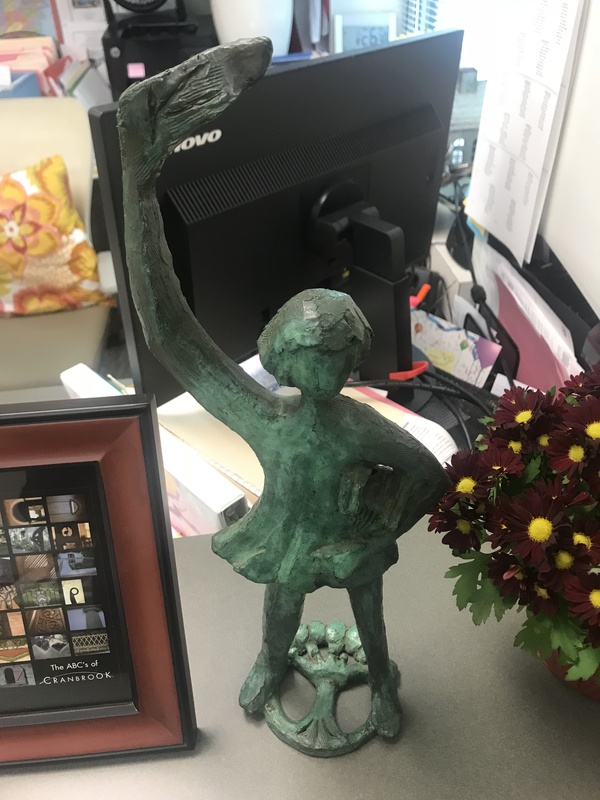 Although she was a tough critic, she was known to be fair, and gained great admiration from both students and fellow teachers. In an anthology of memories, Elizabeth Bennett: A Word Portrait (1983), one former student states: “who could ever forget Elizabeth Bennett, who never raised her voice or lowered her standards for our work; who like Michelangelo, helped us chip out the readers and writers buried within us; who gave us all the charge of language? 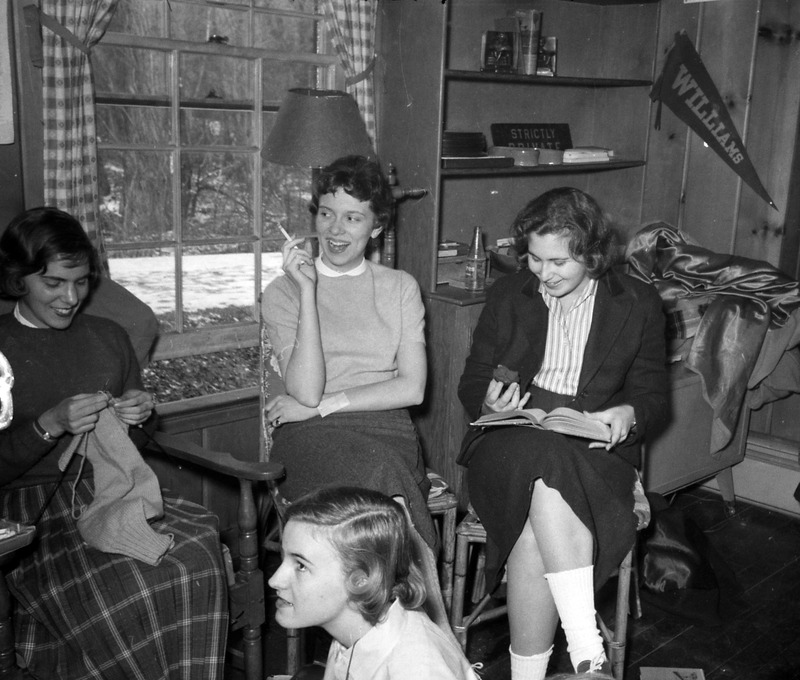 The light in her room did not all come through the windows or from the ceiling” (Carolyn Faulkner Peck, ’52). 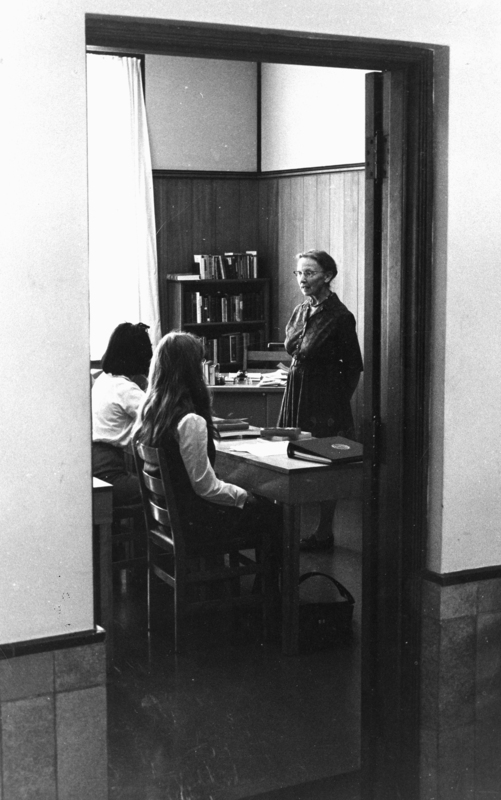 Bennett with students, ca 1963. 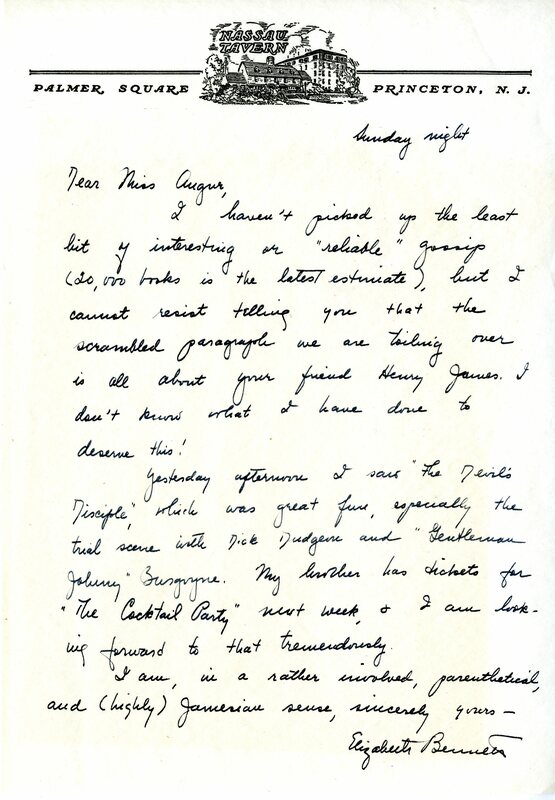 Summer correspondence from Bennett to Augur, 1948. Courtesy Cranbrook Archives. Inspired by Bennett and her passion for writing, several former students established the Bennett Fund in 1984 to honor a faculty member who is distinguished as a nurturer of writing and writers. In the Fall, the award recipient reads from recent works at the annual “Elizabeth Bennett Reading.” This year, the event takes place on Tuesday, September 19th at 6:30 PM in the Cranbrook School Library Reading Room. With a new school year right around the corner, I enjoyed learning about this beloved teacher whose legacy lives on here at Cranbrook. *Editor’s Note: It should be noted that the spelling of Elizabeth Bennett’s name varies from the fictional character in Jane Austen’s novel, Pride and Prejudice.